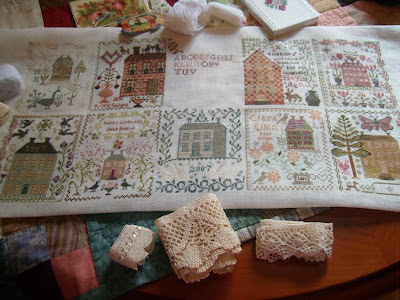 Marilyn from France send me a picture of her Anniversaries of the Heart sampler. It is amazing to see all of the houses stitched together. Thank you for sharing Marilyn! Wanted to give you a quick update about our newest pattern. We've changed the title. It's hard for us to remember all the names we have given various quilts and samplers. I think one of our patterns was already named Pumpkin Vine. (Can I remember for sure? No...but Barb liked Pumpkin Farm so we changed the title.) It is at the printer now....it will be in the warehouse early next week. I might be a bit slower shipping this one out as our warehouse location is moving. (Nothing like picking the coldest month of the year to move!) Barb has #11 stitched. We are waiting for framing and then it should be shipping to the distributor in two weeks. I've sent out all of the fabric and cookbook prizes (Dough by Richard Bentinet) I ran out of the small fabric squares and had to do a replacement prize for some of the contestants. So winners....look for your prizes soon. If you sent me an e-mail and I missed you...please e-mail me again. I loved making this quilt; it was my first appliqué quilt, and I had it quilted. I'm now working on the #3 "Remember Me"  Maude Eloise cross-stitch. I'm really surprised this quilt was Donna's first applique project! After this one she will be able to make anything! Wishing all of you a very Happy New Year! Make one resolution this year. Learn one new skill that you have been afraid to try. Take a class....pick something fun. Hello Alma & Barb, I also love the way Marilyn has stitched all the Anniversaries of the Heart on one piece of linen, it looks magnificent. The Home Sweet Home quilt is stunning and for a first project, that is amazing and inspirational. Love your designs and work, all the best for 2011. Love the new piece for AotH and great classes. I've wanted to learn how to make croissants every since I saw Meryl Streep making them in "It's Complicated"! I want her house in that movie too, LOL. Marilyn's Anniversaries of the Heart is gorgeous. Thanks for sharing this! The quilt is just as beautiful! Pumpkin Vine or Pumpkin Farm - it's a beautiful design by any name! Wow, that really is an incredible first time applique project. The houses all on one is nice too. 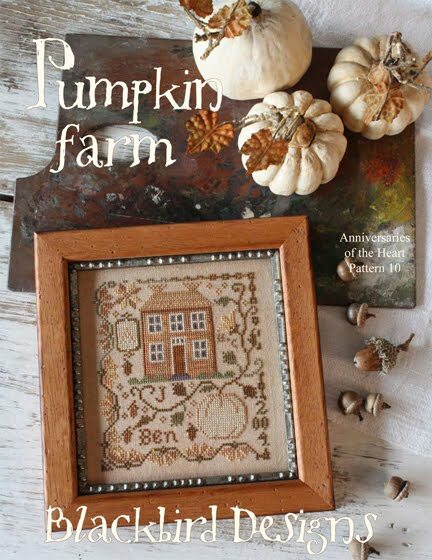 Can't wait to see Pumpkin Farm upclose on my stretcher bars! Marilyn's AoTH is stunning! I've just started mine. I have a long way to go to catch up! Beautiful The houses and the quilt thank-you for sharing. I really like the way the charts are all together on one piece of linen. Just beautiful. By the way I love Garden Club!! Thank you for so much inspiration. The works pictured in this post are just beautiful - eye candy for sure !!!!! I can always count on receiving a big dose of inspiration when I visit your blog....THANK YOU!! Bonjour, merci à vous d'avoir publier cette photo ! C'est grâce à votre talent que nous pouvons broder de si belles merveilles ! Merci à vous ! Sans vous ceci ne serait réalisable ! I love the stitched houses both in the embroidery and the quilt. I've almost finished my house quilt - border awaiting! Love this pattern. It's my favorite of yours. I hand appliqued it all and cannot wait to finish it. Oh I love this pumpkin!! Can't wait to see your new book. What a awesome pattern. You always manage to impress me. It is amazing how many great patterns you both design. Thanks so much for all the inspiration. this ALMOST makes me want to take up cross stitch.... you rock! Pumpkin Farm is very nice! and oh so how the Anniversaries of the Heart look stunning all together like that. Love the quilt and the layer cake. Those are my colors.